Oddfellows Hall on St. Albans Road, Watford. I was born in Garston in 1953 and loved my town. Shopping on a saturday was a must with your pocket money. I had my ears pierced with a cork and pin at the jewellers opposite the post office and went home on the 321 bus looking at them in the windows of the bus. I went to top rank to see Love Affair where they gave away free perfume, I was wearing my grandmothers ring which was too big for me and I had paper in the back to make it fit, after dancing and screaming it was gone and I often wondered who had picked it up, it had a black pearl in the middle. Later I worked at clements and remember the owners son who used to come to the shop, often coming in to the boutique called Shop67 and gave me perfume and asked me out on a date. My uncle used to play for Benskins Football team, he had a heart attack on the pitch and died whilst playing, it was headlines in the Observer. My husband used to wok for Charlie on the clothes stall in the market and i remember him coming home with a two tone suit and check shirts with the button down collars. My first record was bought on the market, cheaper than the record shop. If you close your eyes and sniff you can smell all the aromas: Woolworths wood floors and the biscuit counter with all the tins arranged at an angle and at the end a large pile of mixed broken assortments, the Wimpy bar with the tomatoe squeezy dipensers and frothy coffee. The busses with the conductors who sometimes gave you a half used roll of tickets, we lived by the garage so we had a good supply. I used to go to north Watford library on the bus from Garston 2d and the aroma in the library where you could get 4 books. The swimming baths on a friday with school and the hot oxo drink after. 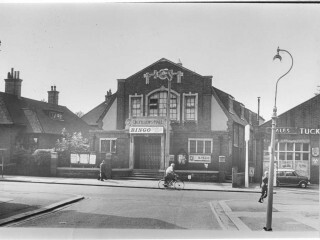 When i was small i used to go with my mum to the oddfellows hall and the Trade Union Hall for her to play bingo. I would collect the tea cups and wash up. Hetty who run the bingo gave me money for this on which i treated my pals to oxo and crisps after swimming. Later I worked at Orphanage Road Ministry of Labour and before that at Chas Brightmans the builders merchants, just up the road. This could go on and on and on but I will finish and look forward to reading more and more and maybe hearing from old pals, one in particular a girl I worked with at M of L,???? Grillo her dad had the ice cream firm, she drew on my hand and done intricate drawings on napkins for my engagement and wedding. Many thanks for an enjoyable afternoon’s reading. This page was added on 07/05/2012. How can I find out why the north Watford roundabout is called The Dome? I was born in 1946, so a bit older, used to go to the North Watford Odeon Cinema for Saturday morning pictures, also did a Milk Round at the Express Dairy depot behind the parade, loved the chocolate milk, called a ‘micky’, Frank Cooper, the milkman i helped used to give me a bottle, as well as my wages. I lived in Beech Road. 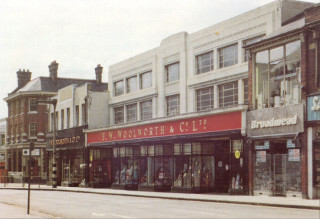 I worked in North Watford Woolworths 1956-1958 on the sweet counter. What a job for a teenager. There was a small Tesco’s near by and a small Sainsbury (look at them now).We had a dress shop (Greens) and a shoe shop. 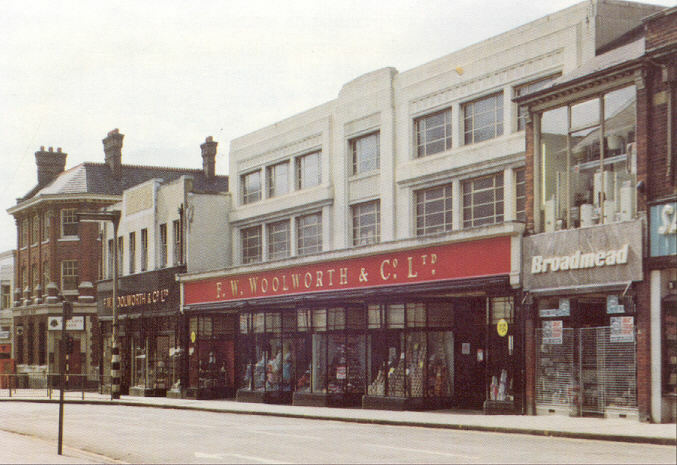 Found this site only recently and it has been wonderful hearing peoples memories of Watford as I was born there and I remember Woolworths and the smell of the wooden floors and the biscuit tins …the Top Rank ..North Watford Library …Wimpy Bar so many good memories thank you all. When I go back now as my daughter now lives there I don’t recognise much anymore so sad. Well done Jacqueline, this is really evocative. I remember Woolworths exactly as you describe it – I used to weigh myself on those funny weighing machines and get the card with my weight on it afterwards – oh to be that weight now! I worked briefly in the market selling socks – luminous green and yellow ones in about 1959. How well you desribe Watford Swimming Baths and the oxos – wasn’t it Mr and Mrs Juba (spelling?) who taught us to swim?